In the old days of DOS there used to be a great graphical, but text based, file manager called Norton Commander. These days the name “Norton” attached to any software product causes people to shudder. In those days, though, everything Peter Norton touched turned to gold. Even after selling Peter Norton Computing to Symantec, they still produced great products. However, they never survived the transition to Windows. Pity. Even in the Windows era I’d switch to booting into command line mode and running Norton Commander. To this day I’ve not found a better file management utility. 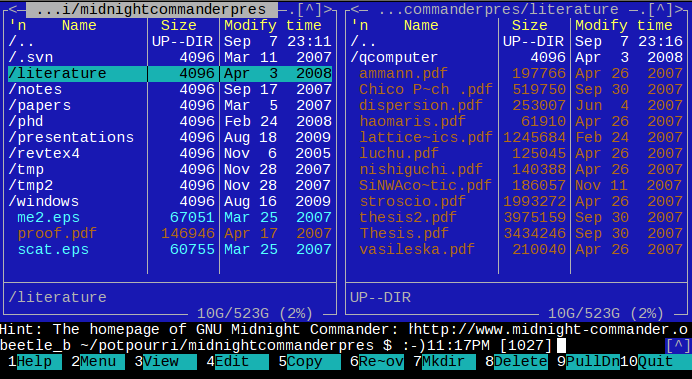 When I installed Linux, I was pleasantly surprised to discover a clone of Norton Commander called Midnight Commander. Clearly, I was not the only fan of Norton’s file utility! And thus I stuck to Linux. Midnight Commander is available in most Linux distributions and I have a habit of screaming at the system administrator of any shell account I have if it’s not installed. Not everyone had the “pleasure” of dealing with DOS, and thus there are plenty of Linux users (including advanced ones) who don’t know about Midnight Commander. I always cringe when I see a fairly sophisticated shell user try to compose a complicated command to do a task that would be easy in Midnight Commander. Furthermore, I feel Linux newbies would benefit from using it as well - it’s not just for power users. And it really is better than any other graphical file management utility. So I wrote the Midnight Commander Guide. It’s written using Org Mode which exports to Beamer and is meant to be viewed in “Presentation Mode” of your PDF viewer. The repository does have a (poor) HTML export. If anyone wishes to clean it up, feel free to do so. Previous Article: Merriam Webster is Rolling in his Grave. Literally.